I tried twice to capture what I was feeling about this phrase, and neither one turned out as I originally envisioned, but it’s ok. This one ^^ was done in watercolor, and I went wet into wet and tried to get the red and blue to mingle on the page, but they didn’t wanna be friendly. Maybe I’m too close to DC? Lol, not sure. So I had to steer the red toward the blue, and at that point, I got those cool stripes, which I decided was fine, and I needed to stop right there, before I fussed with it and killed the spontaneity of the moment. Then, all I had to do was put my green channel marker on the left, and I was done. Which was great, as I didn’t have much time to do art yesterday. Does it give you a flag feeling, or is it just me? Unintended, but I do like it! It may be the closest I ever get to actually painting the flag. For this one, I was working on an almost cream colored barely paisley fabric. I started with Tombow markers on the right, went to Portfolio water soluble oil crayons for the blues in the center, and wound up with Inktense pencils for the left hand side. I don’t really like the part on the right, but since this is basically a log of my art experiments, and which mediums give me which effects, I decided to post the whole swatch. What I like most about the Inktense is that what you see is what you get. When you wake up in the morning, it’s all dry, and it pretty much looks the same. There is very little fading, which you see all the time with watercolor paint, as it dries much lighter than it goes on. I bought this fabric over 20 years ago, I really don’t like it anymore, but it’s nice to know that I can still get some use out of it. I do expect to use pretty much everything I’ve been making lately (all of the abstract stuff), or pieces of them, in my art quilts. At this point, I’m just trying to get familiar with all of the different supplies I have. It’s a fun experimental phase! We are on the hump, and it’s all downhill from here, people! *I live to create* Peace. It does have a flag look, and I like the transition with the uneven lines. Washington, take note. So when does the quilting start? Not sure. I have some deadlines in the office…just trying to play with supplies at this point. Also, I hate my sewing machine and need to replace it. Thanks for your comment re the “flag”. I was just talking to my friend about sewing machines…not that I’ve done any sewing to speak of in years! I still have the Sears machine that I got for high school graduation…very basic. But I also have my mother’s old machine that my aunt gave me and one my mother got for my daughter that she never much used and left here when she moved out. So I need to figure out if I can even sew on a newish fancy Bernina machine, or just keep the basic Sears and find a home for the others. My old el cheapo Singer was much better than the Husqvarna piece of junk that I hate. That cost three times as much, I might add. My sister loves her old Sears machine way better than any of her expensive machines. I hope the Bernina turns out better than my Viking did. I think they are better machines. I’m seriously thinking about getting another elcheapo Singer from the local Walmart. The only thing is that they are made by the same company now as the Husqvarna. Ugh. There’s another brand that starts with a J that is supposed to be good, and you can find them on Amazon very inexpensively. I may try that. The closest dealer for that brand isn’t close by, though, so I tend not to go hat at route either. But I need to do something about the machine, which is what keeps me spinning in indecision, and art quilts are still very brand new for me, too. I have a vision and I know that I don’t know the techniques right now for reality to match the vision, so I’ll keep experimenting until I’m there. Time is a factor right now, too. Maybe by the end of May? We’ll see. I think your red and blue mingled nicely…I like the effect. Sail on matee, sail on! Haha, thanks Rebecca! Anchors aweigh! I totally see the flag and love the freedom you have in your creations. This quilt is going to be so so so amazing! So fun to watch each little piece of the process. Thanks, Jodi. I’m strictly trying out techniques and materials now. My guess is the artwork I’ve produced this year could make a hundred quilts, or more, since they’ll all be fairly small. I’m thinking 9×12 or so, to start out. We’ll see. I have sewing machine issues and don’t know the techniques I need to know to make what I want to make, so the experimentation phase may be longer than I’d like it to be. I’m glad you’re enjoying the process along with me. Yes, I get the flag feel. Those ripples – are they from the paper maybe buckling due to the wet on wet if you didn’t stretch the paper? That happens to me in my watercolor sketchbook journal all the time. I like your reviews on the pencils and markers you’re using. 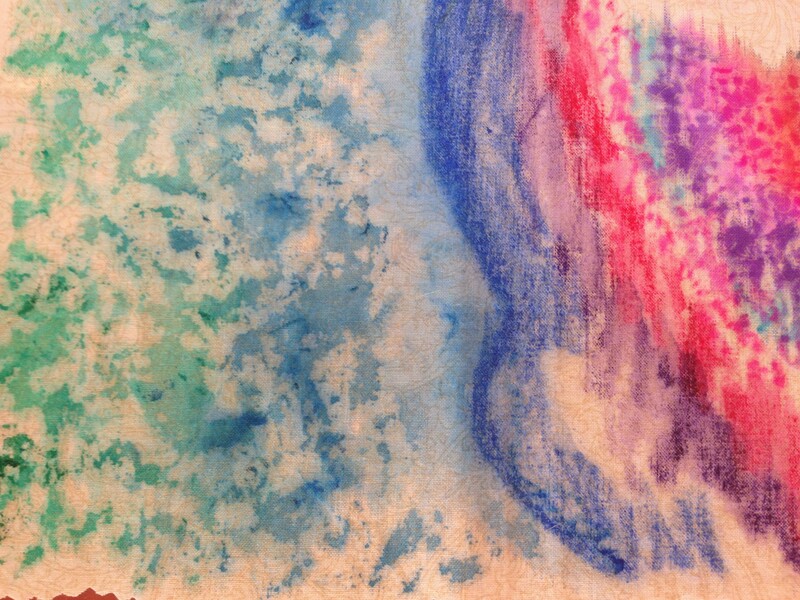 I know what you’re talking about with the fading … that’s why I want some higher quality watercolor paints. No ripples from the paper, believe it or not. 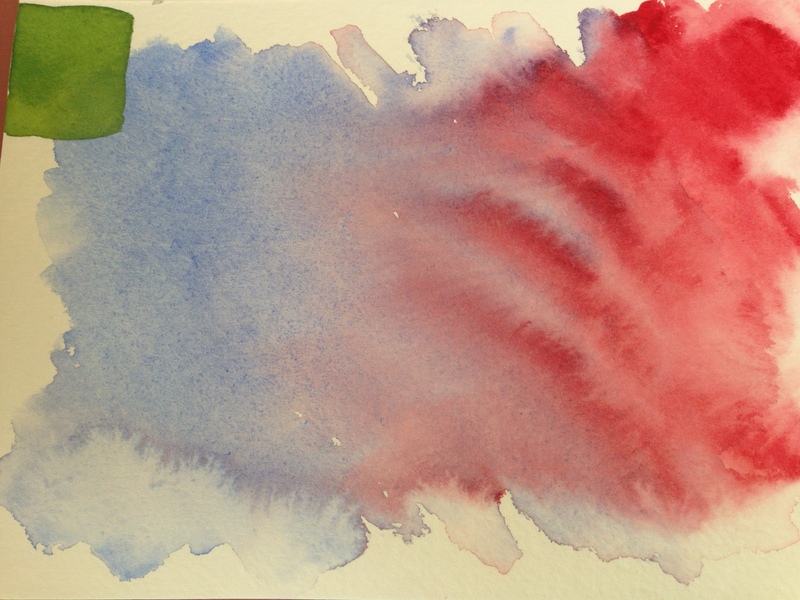 And this was done on an elcheapo Strathmore watercolor card. Nope, strictly from a combination of the water already on the paper and the pigments being pushed around (I went a bit heavy with the paint.) I believe there is no such thing as watercolor paint that doesn’t get lighter after it’s dried. The Inktense is actually ink in watercolor pencil form, which is why it’s different. I do use a high quality paint, and I don’t think that’s an issue. If you find a watercolor paint, pan or tube, that doesn’t get lighter after it dries, I’d love to know about it. I usually use M Graham brand, but I’ve used Winsor and Newton also, which is probably twice the price, and does the same thing. MG and WN are both artist quality paint, so I’m buying most of my colors from MG. I don’t see the point in paying twice as much for basically the same product. Now paper, that’s another thing completely. I have good Arches paper, but I’m too cheap to use it until I feel that my work is “good enough”. Which, as I think about it, may never happen in my own estimation, so I should probably try it and see. I just don’t like to waste it on all of the experimental stuff I’ve been doing. A piece like this can easily be cropped and wind up in one of my quilts. I hate to waste any art supply; it just goes against my grain. Sorry for the very long response! I hope you find what you’re looking for. It’s great to read all this and hear about your experiences with the different mediums. I too am saving my Arches! That’s so cool you can crop it and use it in a quilt, if you decide to do that. Options! Amen for those! If you learn anything differently, I’d be thrilled to hear, Cynthia. I can only tell you what I’ve discovered. I am by no means an expert. OMG, it’s a kid’s watercolor paper pad from Target – for 2.99! I made it into a block and I paint wet on dry and dry on dry with it. So it doesn’t buckle – it’s 140 lb. Hmmm. On on of my blogs, I wrote about the brand with a link – have to look back. I glued the cover into the block. Oh. Ok. The one my walmart carries is the Canson. It was a blue cover to the pad. I just figured maybe the same was at your Target. I really dislike that paper. The Strathmore cards IMO are way better. But not great lol. You’ve mentioned being disappointed in not being able to move paint around like you want, or getting blossoms, and part of that is using lower quality paper. Treat yourself for a couple of days and use your Arches. I find when using Strathmore or Canson watercolor paper (from Target or Michael’s) that I end up “fighting” with the paper and getting frustrated. I think Strathmore and Canson both make some good papers, but I don’t like these brands for watercolor. Thanks, Ruth. I’ve decided to try it. I appreciate your feedback. I do want to add a PS to this: The blue paint in this piece was from a Cotman tube, which is student-grade. The red was M Graham, artist-quality. So the intensity if the two colors does differ, and may also be part of the reason I got the stripes? Not sure. The one thing I know about watercolor is I know nothing about watercolor. I bet if I tried to get this effect purposely using the same paper, paint and technique, it’d turn out totally differently. PS I think painting on fabric is hard – hard to get the colors to flow – I admire that you go to it and get so much color in there. Nice! It’s so cool how we’re all into different things! I love the diversity. Hugs! I am enjoying the color. I also want to try more abstraction to convey a feeling. Your work is doing that for me. Wow! I’m so happy to hear you say that. Abstract work seemed like a must during busy season, and the whole month of April is just different shades of tired for me, which is why it’s continuing (in part). I do find it very freeing and expressive, and you might really enjoy it. I’m looking forward to seeing your work (assuming you decide to post it, which I hope you will). I think part of this journey is just trying all kinds of mediums and subjects to find what’s clicking for me. So far, portraits and wildlife in colored pencil is the only true click I’ve felt. Everything else is just trying and falling short of where I want to be at this point. I agree with every part of what you said, including “different shades of tired.” I’ve got a couple ideas and I’ve seen a few abstract paintings lately that have really stirred my imagination. Thanks. “Trying and falling short”–that motto runs across my life these days. But you know, Kirk, IMO (because I happen to believe in God), we were all created differently on purpose. We all have things that we want to do that are easy for us, and things that are more difficult. Again, I feel this is all purposeful. Your photos and writing are quite beautiful and I bet that comes to you pretty easily? Or at least, you make it look so easy to do, and for me, it wouldn’t be. I think we were all made differently because God wants us all to connect, to need each other. I’m not preaching or trying to convert anyone, believe me, that’s not what I’m about, here or anywhere else, but it’s just something I feel in my gut, and including God in the conversation is the only way to explain it. You make great points. I thought we were on the same page God-wise, too, which is always nice. I think people are so tired of being preached to that sometimes I hear animosity when I bring up God in a totally non-preachy way. But anyway. I think your last couple sentences are great, and probably something I need to try and let sink in to my own life. I tend to be very self-critical when something I’m doing isn’t “measuring up” in my own eyes, which is a conjuration all its own! Interesting conversation here! I really didn’t think this post would get a second look from anyone, much less some nice conversation. I had no idea you wrote a book, but I can’t say I’m surprised. I think you write really well. That is a gift, and we need more people in this world who are not only gifted writers, but are open-minded human beings like you, willing to explore both sides of an issue. Oh, and more people willing to take the time to read those words. Yes. Good conversation. And I love that you wrote “conjuration.” That is perfect. Thank you. IMO life is mostly in the head, the thoughts, and I’ve learned that what we focus on is what we experience. I think this is why art has added so much to my life: It has completely changed my focus. Your experiments are great fun, Laura! I like your flag! As far as sewing machines go, my suggestion is to buy one that is easy to use or you can take classes on to learn how to use it. Also, people trade in their “slightly used” machines all the the time to upgrade to something better. I’d recommend you get one of those as you get all the bells and whistles without paying a premium price. Also, you will want to be able to service it regularly so buying from a dealer can be a good thing. I’m glad you’re enjoying it! I think I want something simple partly because it’ll be easier to use and understand, and hopefully hardy lol. My machine came with a manual. I’m very thankful for that! Make sure the machine has a instruction book! Thanks, Jill! Good point! Mine did too but I truly dislike machines and the illustrations and directions in most manuals. I’m also in a bit of a tired/crabby mood today, for which I apologize. I thank you for your advice. Thank you! And thanks for the visit and comment!